Regardless of the outcome of the EU referendum on Thursday 23 June, organisers have stipulated that the UK will remain eligible to feature in the new Songbook. 34 songs representative of Britain and its musical heritage have made the UK shortlist, following a vote last year by music teachers and students from British music academies, including Birmingham Conservatoire, part of Birmingham City University. 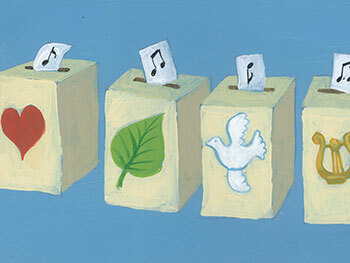 Songs by The Beatles dominate in the six categories, including love, freedom and peace, and faith. David served as Principal of Birmingham Conservatoire from 2011 until 2015 and is now an Emeritus Professor of Birmingham City University. He is also Organist and Director of Music at Saint Chad's Metropolitan Cathedral in Birmingham. The UK Song voting bill features music from the Renaissance up to modern day, with a number of British composers appearing multiple times including Robert Burns, John Lennon and Paul McCartney; the two latter having a record seven nominations among all 28 EU member states, including classics like ‘All You Need Is Love’, ‘Let It Be’ and ‘Imagine’. The EU Songbook is scheduled for publication in May 2017 with all song lyrics being printed in both their original languages and English, accompanied by notes. Further plans would see all songs translated in to the 24 official EU languages, enabling all citizens to sing the 168 songs in their mother tongues. Clearly, the British public are facing a major decision with the EU referendum on June 23. Whatever happens in that vote, we will still recognise the UK’s membership for the time being and welcome them to be part of the first European Union Songbook. The song vote for the UK takes place at www.eu-songbook.org from Tuesday 14 June until Thursday 14 July.